Our Multi-Pocket Brochure Racks come in a variety of styles and sizes. 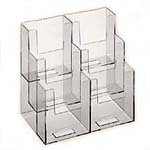 Known as literature racks, and brochure racks, they are produced in the USA at industry low pricing. Holds up to 4" wide brochures Each pocket is 4 1/8" wide x 5" high x 1 3/4" deep Logo Printing available, See SILKSCREEN Page, Call us for Volume Pricing & Custom Sizes! Holds up to 4" wide brochures Each pocket 4 1/8" wide x 5" high x 1 3/4" deep. Logo Printing available, see SILKSCREEN Page, Call us for Volume Pricing & Custom Sizes! Holds 3- 4 3/8" wide Brochures. Made in the USA from clear acrylic Logo printing available, see SILKSCREEN page, CALL FOR QUANTITY DISCOUNTS, BEST PRICE ANYWHERE! Custom sizes available, call for volume discounts! Holds 4- 4" wide brochures Made from clear acrylic. Logo Printing available, see SILKSCREEN Page, Call us for Volume Pricing & Custom Sizes! Holds up to 4 1/8" wide brochures Made from clear acrylic Logo Printing available, see SILKSCREEN Page, Call us for Volume Pricing & Custom Sizes! Holds 6- 3 7/8" wide maximum Brochures Made in the USA from clear acrylic Logo printing available, see SILKSCREEN page, CALL FOR QUANTITY DISCOUNTS, BEST PRICE ANYWHERE! Custom sizes available. This unit has removable dividers and can be configured to hold a combination of 8 1/2" wide and 4" wide Literature. Can be used as 4 pockets for 8 1/2" wide brochures or 8 pockets for 4" wide brochures, or any configuration you need! Made from clear acrylic Logo Printing available, see SILKSCREEN Page, Call us for Volume Pricing & Custom Sizes! Holds 4- 6" wide Brochures Made in the USA from clear acrylic Logo Printing available, see SILKSCREEN Page, Call for Volume Pricing & Custom Sizes! Holds 3- 8 1/2" wide Brochures Made in the USA from clear acrylic. Logo Printing available, see SILKSCREEN Page, Call for Volume Pricing & Custom Sizes! Holds 4- 8 1/2" wide brochures! Matte Black finished. Logo Printing available, see SILKSCREEN Page, Call for Volume Pricing & Custom Sizes! Looking for a literature holder that makes a lasting impression on your customers? You've come to the right place! 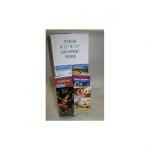 Our large selection of wholesale literature holders features countertop as well as wall mounted designs. Each of the information organizers is a multi-pocket unit, so arranging lots of tri-fold and letterhead sized publications is simple. Use these magazine/brochure displays in an office or lobby to offer flyers and catalogs to customers. The office literature holders, sometimes called tabletop leaflet dispensers, are sure to make a splash at trade show events, academic presentations, and company expos. Choose from plastic, metal, or wood. No matter which information display is selected, it is sure to provide a professional look and outstanding performance. What is the purpose of using these tabletop information displays? •These literature holders help increase your sales, expand client bases, and bolster brand recognition. How you ask? Simple! The brochure pockets keep pamphlets, flyers, and catalogs neatly displayed in an orderly manner. Many users position the multi-pocket literature holder displays near a product presentation or service advertisement. In these applications, the countertop magazine racks serve as an information distribution platform so interested customers can get the details they need. •The pamphlet pockets feature more than one display slot, so many print-outs can be presented at one time. The holders also provide a simpler way for businesses to exhibit weekly or monthly publications. Information, like world news, scholastic journals, club flyers, and local newspapers, can be inserted into each pocket with ease, making setup a no-brainer for any user. The design of every periodical rack ensures weekly periodicals stay visible at all times. •Other times, the brochure and magazine boxes are used to advertise printed materials for retail stores or other merchandising locations. The countertop catalog pockets and pamphlet racks create interest in areas that might normally go unnoticed. Customer attention is effortlessly refocused, so businesses can better drive the sale and make the conversion. Literature Displays The literature dispensers are available in a wide range of styles, shapes, and sizes. For offices with limited floor space, these countertop information dispensers are ideal. The compact assemblies are designed to optimize limited space on counters while offering an affordable display solution. Most of the pocket configurations feature tiered, or vertically stacked, arrangements, so many more publications can be presented in a small area. There are fixed, tiered, and rotating systems to choose from, so have a look around at all the options to find the best possible match. Revolving, or spinning racks, are very popular for those looking to conserve advertising room. The rotatable design enables customers to stand in the same spot while perusing all of the selections. Consider one of these rotating rack systems to hold your brochures or magazines when space is limited. Magazines and brochures have been mentioned explicitly. Are there displays that hold other literature? •Although the majority of these literature distribution tools are designed specifically for either magazines, brochures, or both, there are some other holders that accommodate additional reading materials. •Newspaper racks and holders are also available. These newsprint rack systems are perfect for advertising the sale of all kinds of periodicals. There are tabloid displays as well as newpaper holders for sale in this category. Check out our full selection of floor stands, as well. Choose from wire, acrylic, and wooden models depending on your needs. 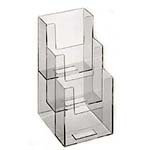 •Literature organizers, sometimes called mail or paper sorters, are another great line we currently offer. These mailbox cubbies are ideal for storing classroom supplies, such as construction paper and assignments, as well as interoffice mail and information. Practically any printed materials are easily sorted and distributed using the paper sorters. The multi-compartment assembly leaves plenty of room for letters, projects, and supplies. There are wood and metal literature organizers for sale, so pick the model that will best suit your educational or professional application.